A major global consulting agency, specializing in brand engagement and communications research, constantly strives to stay one step ahead of the competition. In doing so, they review their methodologies and technologies on a regular basis. 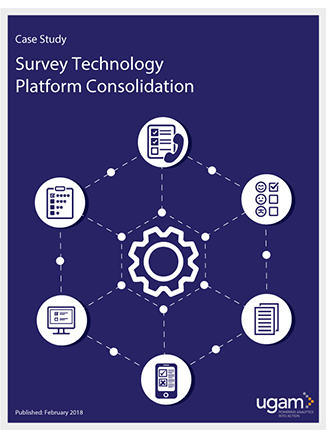 Recently, they determined the need to consolidate their research technologies into one survey platform. They selected Askia, as their platform of choice and turned to Ugam to support the integration and migration. To support the migration, they partnered with Ugam, an expert in integrating multiple technology platforms. Fill out the form to learn more about the six-step process Ugam applied to successfully transition 300 multicountry trackers under 18 months without disruptions to live projects.